Singapore is a great place to raise a young family. It not only has a world-class education system and some of the safest streets in the world; there are also plenty of fun and educational activities to be had by children. As a resident of Singapore, you can take your time to discover all that the city-state has to offer to families, from free outdoor playgrounds, parks and beaches that are scattered all over the island for fresh air and physical activity to free (or highly affordable) museums for some artistic and cultural appreciation. In fact, here is a list of six kid-friendly museums and galleries (there are more!) that both children and parents will be able to enjoy. This museum located at 2 Conservatory Drive at the National University of Singapore (NUS) has more than 20,000 specimens on display and 15 zones that cover different themes, ranging from plants to dinosaurs. Here are some of the interesting exhibits to look forward to: three diplodocid sauropod fossils, which are apparently some of the largest creatures ever to walk on the planet; a 10.6-m long female sperm whale that is about 10.6-m long, discovered near Jurong Island in mid-2015 (the first ever sperm whale to be found on record in Singapore); and a specimen of the chengal pasir, a rare type of rainforest tree thought to be extinct in Singapore but found in 2002. The tree, by the way, is supposedly the reason Changi was given its name. Situated at 31 Marina Coastal Drive is the Singapore Maritime Gallery. Singapore’s history and economy were very much built on the success of its port. The gallery allows you a glimpse into the past, showing how Singapore started out as a small trading post and burgeoned into one of the busiest harbours in the world today. Kids can have a go at being captain at the gallery’s Ship Bridge Simulator, where they will be allowed an attempt to manoeuvre a variety of vessels through different types of missions. On the rooftop is also a maritime-themed playground that overlooks the coast. Definitely a great option to spend a few hours with the kids. 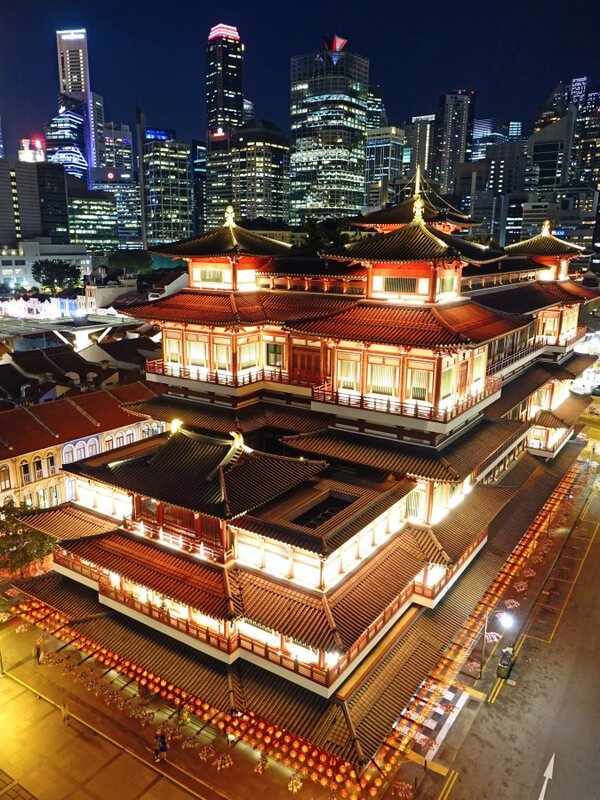 This grand temple and museum (which cost $62 million to build) located in the heart of Chinatown boasts a very rare and precious relic—a tiny piece of a tooth that is said to belong to Buddha. It was discovered in Myanmar in 1980 among the ruins of a stupa and is now being housed in this temple in Singapore. The tooth can only be viewed at specific times but there are also other relics to be viewed and you can learn about Buddhist history and culture while you are there. Need a break? At the rooftop are pavilions where you can enjoy some peaceful and quiet time. A visit to this museum on 26 Seah Street will feel like a trip back to the past for moms and dads. There are, for instance, old tin biscuit boxes and pedal cars that may remind some visitors of their childhood among its vintage collection. The Singapore Air Force Museum located at the Paya Lebar Air Base has aircraft and artefacts on display that visitors and see and touch, including a 1975 vintage two-seater TA-4S Skyhawk plane and the Alouette III, a helicopter that in 1969 was part of the RSAF’s first squadron. You will also get to learn a bit about the history of the RSAF, explore some interactive exhibits and try out a multiplayer simulator in which you can experience ‘flying’ a plane and carrying out various manoeuvres that are done in combat. Learn about Singapore’s brave firefighters at the Civil Defence Heritage Gallery at the Central Fire Station, painted a distinct red and white, over at Hill Street. The kids will get a kick out of climbing into the vintage fire engines on display and pretending to rush off on a lifesaving mission. The Gallery also showcases the latest in fire-fighting methods and explains to visitors the job of the Singapore Civil Defence Force (SCDF). You will want to plan your visit on a Saturday morning so that your children will get to enjoy the Fire Station Open House, where firefighters will not only be demonstrating their capabilities; it is also an opportunity for the kids to try out the equipment that firefighters use. For something a little out of the box, located on Telok Ayer Street next to the Thian Hock Keng Temple is Singapore’s first ever musical box museum, which has over 40 musical boxes on display, all from the museum founder Mr Naoto Orui’s private collection. Admire the centuries-old music boxes and be wowed by their amazing craftsmanship, while learning about Singapore’s rather interesting relationship with musical boxes throughout history.